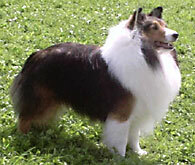 The Shetland Sheepdog breed standard states that Shelties are "marked with varying amounts of white". The standard specifies two limitations to this: "Conspicuous white body spots" are a fault, and "Specimens with more than 50 percent white shall be so severely penalized as to effectively eliminate them from competition." Within these limitations, the standard does not express any preferences. A dog with no white around its neck is just as acceptable as a dog with a broad full white collar. 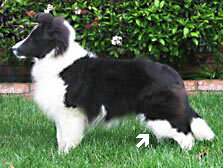 Typical white markings occur in what is called the Irish pattern: white feet and legs, white around the collar and forechest, white tail tip, white muzzle and chin, and white blaze. The absence of white in any of these places is not a fault. 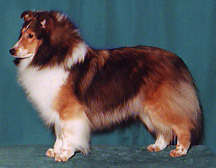 This Sheltie shows the flashy white markings that some people prefer, but the breed standard does not give these markings any preference. The absence of a white collar on this Sheltie is NOT a fault. The dark front legs of this Sheltie are just as acceptable as white legs. 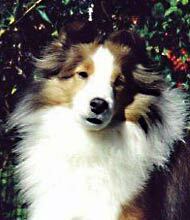 A Sheltie may have a wide blaze on his or her face, or no blaze at all. The breed standard does not express a preference. All three of these Shelties are Champions. 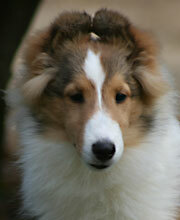 White blazes on the face of the Sheltie change as a puppy grows. A narrow blaze may completely disappear. A wide blaze will narrow. 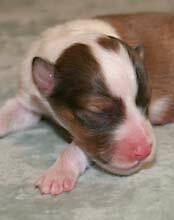 This pretty puppy shows typical changes in the amount of white on the face as she matures. Color-headed white Shelties are predominantly white, with a head color of any of the allowed colors. Unlike homozygous merles (double merles), color-headed whites have no vision or hearing defects related to their color. They were permitted by the breed standard until its revision in 1952. There is a group of Sheltie fanciers today who are in favor of revising the standard to allow color-headed white Shelties to be shown on an equal basis with the other allowed colors. More information is available from the White Shetland Sheepdog Association. 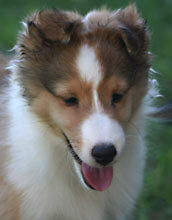 Shelties who are able to produce color-headed white puppies are considered to be white-factored. White-factoring is not necessarily a bad thing, as it is associated with flashy markings that are favored by many enthusiasts. 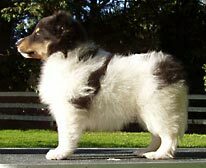 This white-factored Sheltie shows the typical white stifle markings. The molecular genetics of white markings have not been completely worked out. It is likely that several different genes ar involved. One gene has been identified, which corresponds to Little's "s" series. 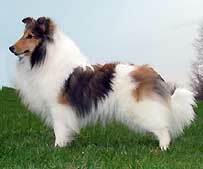 In Shelties, the dominant is the so-called Irish pattern, which produces typical white markings on the chest, face, neck, legs, undersides, and tip of tail. A heterozygous, or white-factored dog, has more extensive white markings, and typically has white up the front of the stifle. A Sheltie who is white-factored has a recessive gene for white or white spotting, and can produce color-headed white puppies. 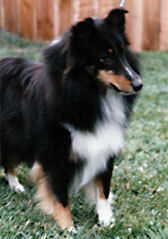 The homozygous recessive results in a predominantly white Sheltie, usually with a solid-colored head. 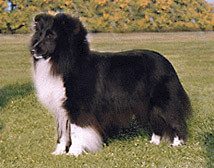 The "s" series does not appear to determine the presence or extent of the Irish-pattern white markings that are universal in the Sheltie. It also appears that a second gene may be involved in white markings, as the extent of white markings is not related to the "s" locus genotype in all dogs. 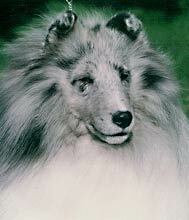 Blazes on the face may be inherited independently, as it is possible to have color-headed white Shelties with no blaze at all. The white color of a homozygous merle is the result of totally different genes from those involved in white markings. See the color inheritance page for more information. Ticking is inherited independently of the white markings, and is superimposed on the existing white. Ticking is considered to be dominant to the lack of ticking in most breeds. There is however a continuum of ticking from almost none to very heavily ticked, suggesting that several genes may be involved. See the color inheritance page for more information. 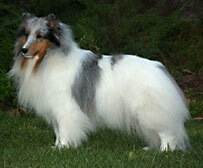 The term ticking refers to small flecks or spots of color in the otherwise white areas on the Sheltie. Ticking is not present at birth, but shows up in the first months of life. The color of the ticks is the color that would show on the body if it were not covered by white. Thus a sable will have sable ticking. A tricolor will have black ticking around its neck, and black or tan ticking on its face and legs, the color depending on the location of the ticking. Ticking is NOT listed as a fault in the breed standard, and the Sheltie pictured at right is a champion. A homozygous or double merle is a predominantly white dog who usually has defective hearing and/or vision. Double merles usually have a predominantly white head, which distinguishes them from white-factor white Shelties, who are physically normal. The merle gene is located on a different chromosome from one recently discovered white-factor gene. White-factoring is unrelated to merling and is inherited completely independently of merling.